I used to play Everquest 2 (EQ2), but like many MMOs it can be intense and tiring. People burn out. I did, for the second and probably final time. But the casual raiding guild I was in has a website with forums where you can post messages, so I kept in touch with people that way, and was happy to do so. And that was how I learned that several key players in the guild were changing servers, from the one we had been on for years (although it had recently merged with another) to Drunder, the prison server. If that sounds a bit ominous, it is. Drunder is where repeat offenders of the game’s norms and rules are sent by Daybreak, the company that now runs EQ2 (previously run by Sony). Somewhat strangely, you can request that your character be moved there. However, like Australia for felons in the early 19th century, it is a one-way trip. Once there, your character can never be moved back to one of the other servers. Yet this unusual move by my guild mates was done for a very good reason: they enjoyed playing the game in a slightly different manner than was intended—they enjoyed multi-boxing. Multi-boxing was something they had done for years, were quite good at, and in our raids we often relied heavily on their multi-boxing expertise. Multi-boxing is not easy, as there is a lot more to keep track of than with one character, and to be successful you need practice, the right characters in your group, and the right macros (shortcuts) set up for the variety of commands you will need to send given the situations you will encounter in-game. 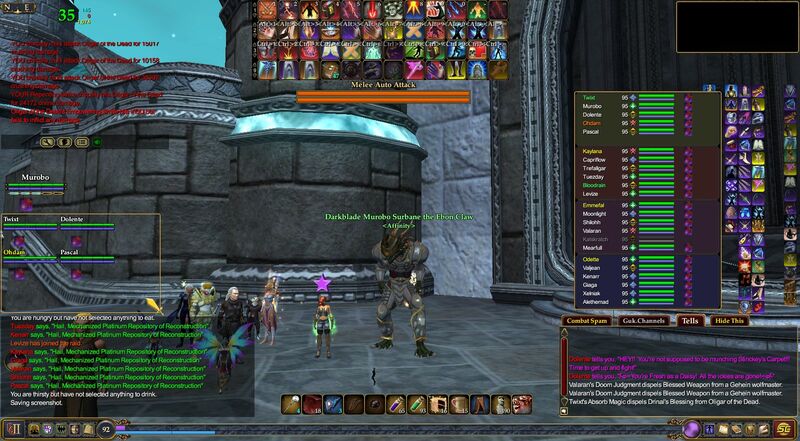 Usually in EQ2, players box 2-6 characters as the maximum group size is 6. With a full group, a player can run the group-based dungeons, but I’ve even seen one guild mate multi-box 12 characters (6 each on two computers) in order to access x2 raid content (“x2”, that is two groups making up the raid, as opposed to x4, the maximum number of characters allowed, four groups of 6 for 24 characters). Multi-boxing generally works in the following simplified manner compared to regular play with one character. Normally, you might use the keyboard to give movement directions with the long-canonical AWD cluster of keys, and mouse-click an onscreen button or a use number key for an action (like a specific attack). When multi-boxing, you do those same things, except your keyboard and mouse inputs for your main character (which has the largest window of all the copies of the game which are running) are mapped to each and every one of the characters (the boxes) you are running, although you might turn off movement for all but your lead characters and have the rest on auto-follow, and you might only send keyboard non-movement commands so your lead characters targets and the rest target through that character (the basic idea is simple, but overall it’s complex). If you hit the 1 key, each character will do whatever it has mapped to the 1 key for that character. The same for 2, 3, and so on. Whereas normally in a group or raid, each group member would have to know which actions and spells were appropriate over a period of time given a situation and given the group composition, now one player has to have all of that situational knowledge for the characters in their head and mapped (mostly) to the 1 through 0 keys. You might have a “hate gain” key, used for the start of the attack and occasionally, so the tank can keep the enemy’s focus off the DPSers. You might have a “super heals” key if things go badly. And so on. Granted, not all encounters can be multi-boxed well (perhaps one character needs to run off and click on some object on the other side of the room at some point in the battle), but many can be. 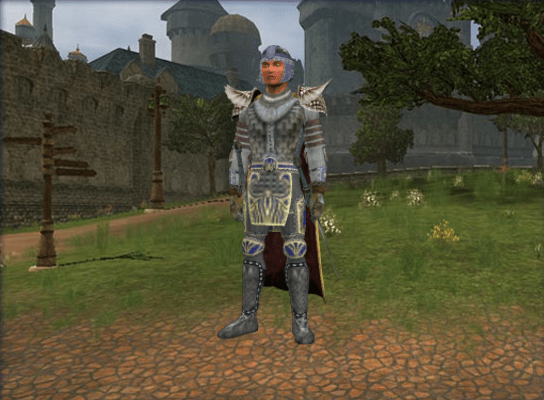 My guildmates used a multi-boxing app called ISBoxer, you can read more about it and EQ2 at the ISBoxer wiki. ISBoxer setup video for EQ2, from 2013. Daybreak, and Sony before them, used to quietly allow multi-boxing. For the most part, multi-boxing didn’t interfere with players who didn’t multi-box, although it was frowned upon in contested areas. This meant that it was generally okay during raids and dungeons which were instanced—because only your group or raid was there in your own “instance” (copy) of the dungeon, you couldn’t directly use multi-boxing as an advantage over other players. It also meant more accounts (as each “box” needs its own account to run one character), and if they were paid accounts it meant greater revenue for the game. But at some point in early 2015, that changed. Daybreak decided to crack down on multi-boxing. Why, I’m not sure. Several of our most important raiding guild members would no longer be allowed to play the game in a way they enjoyed, and in a way that helped everyone in the guild (especially during raids). It was also enjoyable for those who didn’t multi-box, as it was impressive to watch and on occasion we might have text conversations with boxed characters (that is, the secondary ones, not the main) in the open guild channel where everyone could see, talking to a character we all knew had no human directly behind it, constructing some amusing narrative about in-game events or other people. Multi-boxing was over, our guild was in trouble. Except there was one possibility: the prison server. Despite EQ2’s age and slow decline, Daybreak had created a new server (while merging the regular ones to keep server player numbers up) for disruptive players. Named Drunder, it was exile. If Daybreak decided you should be sent there, there was nothing you could do about it and you couldn’t come back. Yet, because Daybreak has cast you out for breaking the rules, there are few rules there. Daybreak doesn’t care what happens there, and spending time policing behavior on Drunder makes no sense, so they don’t. Do whatever you want. This meant that multi-boxing wasn’t forbidden on Drunder. My guild mates could still multi-box, but we would never see each other in-game again unless we all moved to that server. And even if we did all move together, we would never again see the other players on our server who weren’t in our guild, such as former guild mates, and other players with whom we had all played. Changing servers was not just a technological issue (submitting the request, waiting for your character’s data to be moved to the Drunder server), it was, far more importantly, a social one. Besides leaving friends, the prison server meant one more thing: no new players, except the jerks who get exiled (and who wants to play with them?). Socially this server move was a big deal. My main character in EQ2. Servers, generally used for computing load, time zones (so players are on at the same time), and language, are like the board in a board game. If you play Monopoly at your house with your friends and family, and I play it with my friends and family at my house, we can brag and share tips all we want in the forums, but we will never see each other in-game: you’re on your board and I’m on mine. We’re playing the same game, but we’re in different copies of it. This is generally understood by gamers who have experience with servers, but can be confusing for non-gamers, especially when game research and popular press coverage describes WoW as having millions of players who all play together. It wasn’t an easy decision for my guild mates, there was a fair amount of discussion about it on the guild forum, and people wondering what to do. Some went and reported back (they joked they were still alive since they weren’t on the old server and we couldn’t see them if they played so it was like they no longer existed to the rest of us, but they said it wasn’t very social over there), some followed over time, some did not change servers. A few others had also burned out and were investigating other games. Between the burnouts like myself and the dispersion, it was the beginning of the end for the guild, as we would no longer have the time spent together we used to for our twice-weekly raids and general EQ2 time. Activity on the guild website has slowly tailed off—I know because I miss the people, so I check the site. The guild is (mostly) gone, but it will have at least one long-lasting legacy besides the memories. Two of the members, who met up during a small guild get-together in real life and who both multi-boxed, moved to the same part of the country to be with each other, were married, and had a wonderful and cute child! Multi-boxing and self-imposed exile aren’t really such a bad thing after all. Nathaniel Poor is an independent scholar who works for the Underwood Institute research foundation. His work focuses on online communities and gaming, with an eye towards history, legal issues, and the socio-technical. The first computer game he remembers playing is Wizardry, which was great because you didn’t have to walk around town to find vendors. He was addicted to Ultima IV as a teenager, but his favorite game so far is Elder Scrolls IV: Oblivion. He completed his PhD in communication studies in 2004 from the University of Michigan. After teaching for two years, he moved to New York where he hung out with the tech crowd and learned Python, R, data visualization, and machine learning techniques. Recently he moved to Cambridge, Massachusetts.